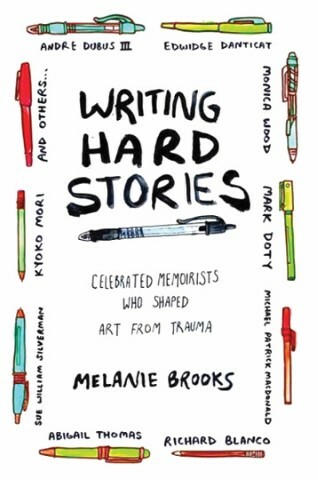 In the interest of full disclosure, Melanie Brooks, author of “Writing Hard Stories: Celebrated Memoirists Who Shaped Art from Trauma”, is my friend. And because she’s my friend, I know how hard she worked on this book, traveling the country to interview memoirists about how they managed to get down the words, to tell their stories about tragedy, grief, pain. How hard she worked to find the answers she needed, and to share her insights with others on a similar path. Melanie began this book as part of her MFA program. She’d been writing her own hard story—about the death of her father from AIDS in 1985—and as she struggled, she tried to find a book that offered guidance on how to live through the grief dredged up by remembering the very story she felt compelled to tell. She couldn’t find one. So, she wrote it. 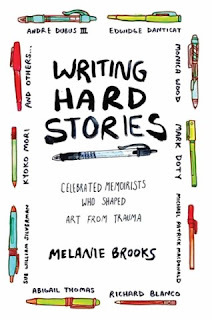 In “Writing Hard Stories”, Brooks interviews authors including, Andre Dubus III, Monica Wood, Mark Doty, Richard Blanco, Edwidge Danticat, and many others. She asks them the question they almost never get asked: How did you survive? She wants to know how they lived through the pain, how they handled the opinions and maybe even the objections of their family and friends, how they dealt with the truth, or the truth as they remembered it. And, because Melanie is warm and thoughtful and wonderful, they all told her. “Writing Hard Stories” is also a book for readers who want to gain some insight into the writing process of some incredible authors. Melanie’s interviews make the reader feel like she’s right there in the room with them, sipping on her own cup of tea, just listening. Meet author Melanie Brooks here at the Library on Wednesday, October 11 at 6 p.m.
For more information, call Barbara at: 892-1908.